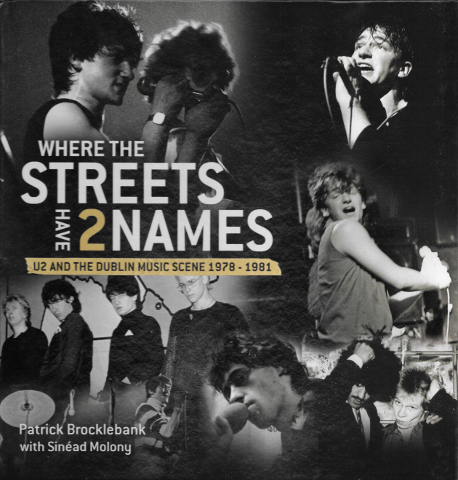 Tom Dunne interviewed Patrick Brocklebank recently about the newly published photographic memoir ‘Where the Streets Have Two Names‘. Tony Clayton-Lea reviews the book for The Irish Times in this piece ‘‘Dublin exposure: Citizen photography of U2 and other early punks’‘. While the book is quite U2 centric for obvious reasons a lot of other usual suspects feature including Dave Fanning, Ian Wilson, The Vipers, The Atrix. The book is published by Liberties Press and the Tom Dunne Show can be heard from 10pm till midnight Monday through Thursday on Newstalk. Where the Streets Have 2 Names features hundreds of previously unpublished photographs by award-winning photographer Patrick Brocklebank, documenting U2’s early days as well as the rise of other groups who were part of Dublin’s music scene at that time, such as The Virgin Prunes, The Blades, The Black Catholics, The Undertones and The Buzzcocks. The photos capture iconic moments in the lives of these bands, particularly U2, and are accompanied by numerous untold anecdotes about the band members and the long-gone music venues of that era, where many of the bands’ most seminal gigs were performed. The book captures the atmosphere of the time – a recessionary Dublin, a youthful individuality and a sense of rebellion – and provides a fascinating insight into the culture and characters on the Dublin music scene from 1978–1981. Update adding another radio show appearance.. This entry was posted on February 6, 2014 at 11:38 pm and is filed under Books, interview, Music with tags interview, newstalk, Patrick Brocklebank, tom dunne. You can follow any responses to this entry through the RSS 2.0 feed. You can leave a response, or trackback from your own site. Love the interviews and of course the incredible book, I am so sorry that I did not bring a camera to the gigs that I went to down the country at the same time which would show that there was a bit of life outside the pale for example in 78 and 79 I saw the great D C Nien in the Campus / Arcadia on at least 3 occasions along with seeing them supporting XTC in the Aula Maxima in UCG and also in Hayes Hotel in Thurles with Joe O’Herlihy on the sound desk. Hot Guitars supported The Stranglers in the Arcadia and I think maybe a few weeks earlier we caught Otaway and Barrett in the same venue along of course with the surreal Nun Attax, early Micro Disney and Mean Features at the night of the recording of the 12 inch on Reekus. Surely the most intriguing photo in the book is that of Limerick band Reform who really shot to fame by playing our wedding in ’82 !